July 27, 2008 by Dave! To all my fellow Bar Exam takers who will be joining me in hell on Tuesday and Wednesday, good luck!!! May 19, 2008 by Dave! Graduation was yesterday. 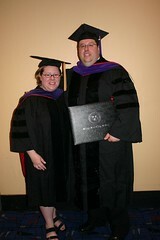 My wife, Kristyna, was able to hood me, because she’s an alum (J.D. ’00). I can’t believe it’s over. Well, I do have to wait for my final grades to come in! How weird is that? But barring some catastrophe, I’m done. At least for a week. Next week this time, I’ll be sitting in a Bar/Bri lecture, trying to prepare myself for the Illinois Bar Exam. February 8, 2007 by Dave! Thank you for the frigid blast of arctic air. We do not mean to seem ungrateful, but we find the sub-zero temperatures are not to our liking. With so many wonderful things to export, perhaps next year you might consider sending down national health care? February 1, 2007 by Dave! Molly Ivins passed away after battling cancer. Like many people, my first exposure to Ivins was with Bushwhacked which is a great book. I’d highly recommend checking out it and some of her others, as well. She had a great heart and great humor.